Split a large audio file into tracks according to cue file on Linux | goFLOSS! You might find it useful to divide a music release that consists of one entire audio file, according to the .cue file that comes with it. 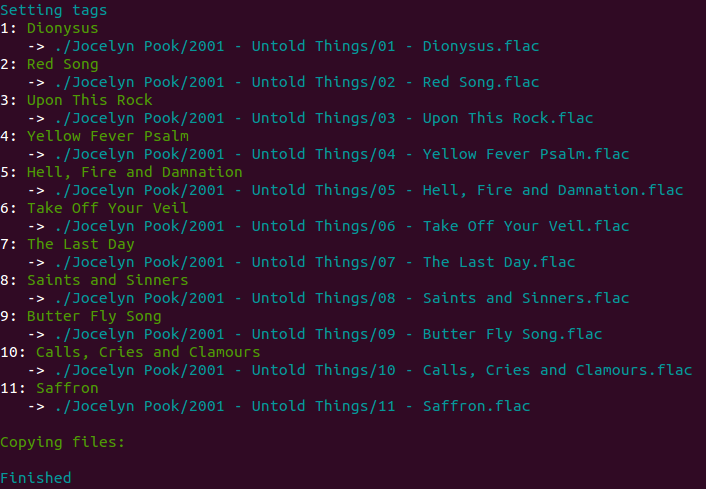 There is a very easy way to do this on Linux, thanks to an open source package called split2flac. Note that the following instructions are for a debian-based distribution. If you want to use a lossy format, I recommend you use the open .ogg format. You will then need to install extra packages depending on what you want to do. In my case, I had to have wavepack and flac too because I was going from a .wv file to .flac chuncks. If you want to use split2ogg to save some hard drive space, you will need vorbis-tools. If you get an error, it is most likely because you are missing a particular package for your format conversion. Have a look at the readme file to find out what you are missing. split2flac will automatically find the .cue file and the covers that are in the directory, and create a new folder with the covers and the split, tagged and converted tracks!